Nearly 50 members attended the 2014 Midlands Carriagedriving AGM and Competitors’ Conference, held at the Kegworth Hotel on 16 November. Pam Brown, Angela Flanagan and Ben Smith were re-elected for a further term of office on the club’s committee. The election result was followed by a report from Treasurer Mike Hawley who stated that the club’s finances were in a very healthy position despite expenditure created by an advertising campaign, building new obstacles and setting up a new in-house website. The Competitors’ Conference covered plans for pre-season training to be held at Catton Park, with the emphasis on providing coaching in areas specifically requested by participants; dressage judges will provide feedback and a full cones course will be available. 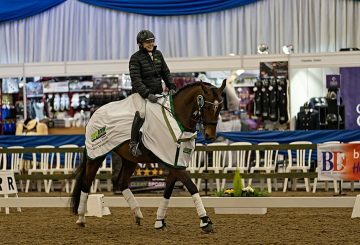 Questions from the floor included the use of a practice dressage arena at events, allowing competitors to drop a level for a year if bringing on a new horse and new rule changes. Club President George Spencer handed out Points League rosettes and trophies; among the recipients were Peter Young who gained points in pony pairs, horse pairs and horse teams – the latter two driving his family’s Shires – and Anne Chambers who won the Tandem Horn, a trophy she was first presented with over 20 years ago. The Chairman’s Trophy went to Geoff Goodwin in acknowledgement of all the hard work he put in to ensure the successful running of MC’s inaugural event at Belvoir Castle. Belvoir will feature on the club’s 2015 calendar while improvements and another permanent obstacle will be built at both Widmerpool and Onley Grounds. As in 2014, Onley will host the BYD National Championships; Onley and Belvoir will host National Novice Qualifiers. All competitions will include a one-day-event on the Sunday.